Author and former New York Times columnist Anand Giridharadas discusses his book, Winners Take All. 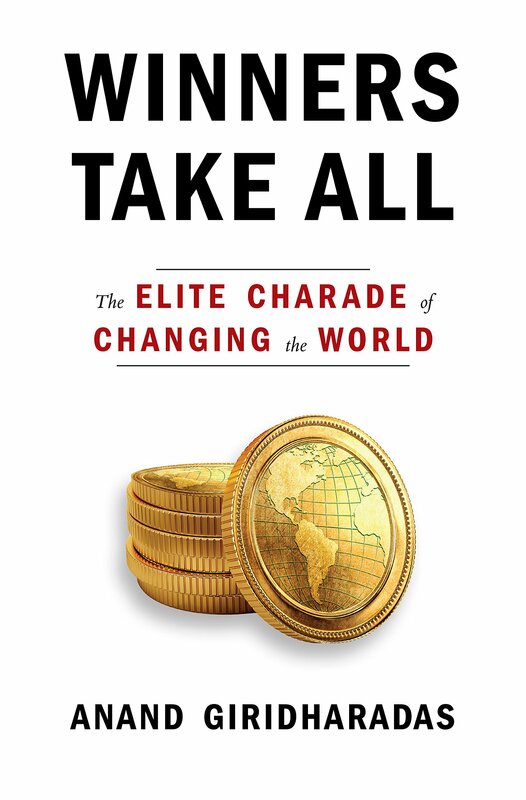 Peter Vanham, U.S. media lead for the World Economic Forum, critiques the condemnation leveled at some prominent mainstream economic ideas on how to overcome income inequality — and their supporters — in this review of the new book, Winners Take All: The Elite Charade of Changing the World, by author and former New York Times columnist Anand Giridharadas. You can listen to a recent interview with Giridharadas from the K@W radio show on SiriusXM using the player at the top of the page. Joseph Stiglitz (among a small group of economists and policy analysts) has pointed to the fundamental system problem shared by nearly all societies. Namely, systems of law and taxation that favor rentier privilege and rent-seeking over the actual production of goods and delivery of services. The solution is to change the way government at all levels raises revenue to pay for public goods and services. Taxation of rent-derived income and gains on the sale of land and financial instruments is where the funds should come from. In the United States and some other countries, the taxation of real estate is a function of multiple layers of local government and public school districts. Property improvement values should be made exempt from the tax base, with the objective of public collection of the full potential annual rental value of every privately-owned location. This change would curtail sprawl by providing a financial incentive to owners of land to develop the land held to its highest, best use (or selling to someone who would do so). Rent-derive income can also be captured by restructuring the individual income tax to combine simplification with real progressivity, inasmuch as it is in the highest incomes where rent-derived income is greatest. What might this look like? Exempt all individual incomes up to come percentage of the national median. Eliminate all other deductions and exemptions. Above this level impose an increasing rate of taxation on higher ranges of income. Paul Allen died this week. He is noted as being the co-founder of Microsoft and the largest philanthropist to the Seattle community. Unlike Bill and Melinda Gates charitable funding through their foundation and pledges from wealthy donors, Paul Allen choose to keep his very generous donations close to his Seattle home. Mr. Allen’s charitable work was in addition to his investments in Seattle’s pop art/music scene, tech businesses and sports franchises, including the Seattle Seahawks. Where am I going with this? Paul Allen’s wealth was partly given back to a community that didn’t contribute to the bulk of his wealth or in need of Allen’s concentration of philanthropic and business funding. While Bill and Melinda Gates looked at global diseases and climate change as worthy of Gates Foundation funding, Mr. Allen’s notable generosity was disproportionately focused on his ‘home-town’. Seattle, like Austin, San Jose and satellite communities surrounding Silicon Valley, were home to global enterprises that received national and foreign profits. These major tech cities generated the highest per capita GDP of all urban census metropolitan areas in the United States. Wealth begets wealth. Rich people, other than Bill & Melinda Gates Foundation pledgees, often don’t look beyond local opportunities to elevate suffering. Instead, they seem preoccupied with having their names on hospitals, universities and distinguished architectural structures to house a variety of cultural artifacts – museums, art galleries, etc., funded by their philanthropic choices – that are tax subsidized by federal and state taxpayers. I have read thoughtful well-written articles by professional writers that offer analysis and prescriptions to inequality challenges in advanced countries. Some articles focus on complicated measures to eliminate poverty and enhance social services to help those in need. Others provide a simpler method that has been around since ancient empires existed a few thousand years ago – hundreds of years before the rise and fall of the Roman empire. That method is taxation. The best approach to solving poverty is by taxing the wealthiest people and using those taxes to fund minimum income and social policies to increase individuals’ incomes in relation to their national standard of living and poverty line. Income to these people would need to be focused on food costs, shelter, schools and healthcare in each jurisdiction. The contrary argument, that welfare detracts an individual recipient from finding work and contributing to GDP, is a Straw Man argument. Analytical charts are drawn to prove the point! But does is not dependend on ‘a priori’ assumptions on a case-by-case basis. Are all poor people cut from the same cloth? The reality is that many people are unemployable due to demand for work exceeding work supply. Some unemployed people are unemployable due to mental or physical illness. Other unemployed live in poor communities that do not have adequate transit and affordable means to find and secure work in suburban locations that have become new homes to old businesses and affluent residents who had abandoned city centers to avoid higher taxes, crime rates and poor schools with unqualified teachers. The barriers to acquiring a job that pays a living wage is the distance between home and work location in the absence of effective and affordable transit servcies. Job seekers require affordable transit services to find and hang-on to full-time work that will pay a living wage. The greatest challenge facing poor people outside of developed countries is a lack of law and order and adherence by political leaders and local police to the rule of law. There is too much corruption in undeveloped and developing economies. Developed countries need to resolve global poverty issues by funding national security policies that include police training to interdict organized crime networks operating freely in less developed and developing economies. The net result of a global “New Deal” would be to super-charge economic activity in less developed countries and alleviate abuse of citizens by criminal gangs engaged in extortion, assassination, drug trade and human trafficking. Improving economic standing and reducing fear of gang violence are the keys to social-economic development and alleviation from wide-scale poverty. The cost of a war on global poverty requires funding. We fund these policies by increasing taxes on wealthy global citizens. After-all, much of the economic growth that occurs in poor nations trails-back to enterprises in developing and developed nations. It’s a Win-Win policy prescription. A service-oriented global circular economy. There is much truth to what you have written Mr.Aceti. Ability to pay is one but not the most important criteria for taxation. How income is derived and how wealth is obtained are others. The approach to tax reform I have come to has the added virtue to significantly expanding equality of opportunity. Currently, income is redistributed from producers to non-producers. You propose to mitigate this by another round of redistribution. I recommend we end rentier privilege and attack the problem of poverty at its core.